Jimmy Speaks about the Sharks! "I HIRED THEM ON THE SPOT." When Jimmy Buffett was still building his Margaritaville Cafe in Orlando, Florida, he already knew who his house band was going to be: The Landsharks. He had made that decision immediately after performing with the Landsharks several months earlier in a memorable impromptu performance outdoors in Key West, Florida. On Opening Night at Margaritaville Orlando, just a little while into into the Landsharks' first set, Jimmy once again appeared on stage -- Surprise, Surprise! as he likes to say. The crowd went wild! When the audience finally settled down, Jimmy Buffett performed with The Landsharks, but first he spoke to the crowd about the band. (click one of the speaker icons above to listen to Jimmy Buffett). 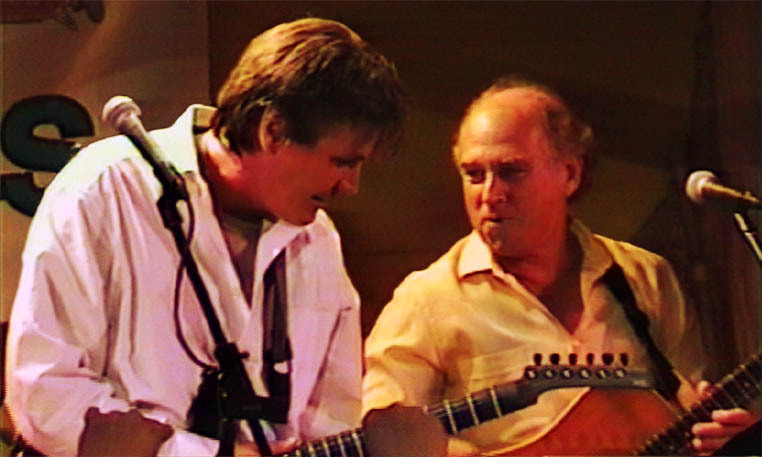 Gary Roland and Jimmy Buffett on Opening Night at Orlando, Florida's Margaritaville Cafe. 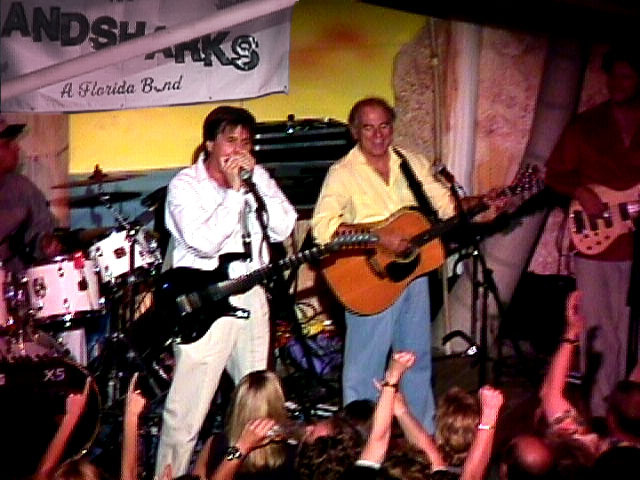 Gary Roland and Jimmy Buffett perform Opening Night at Orlando, Florida's Margaritaville Cafe.